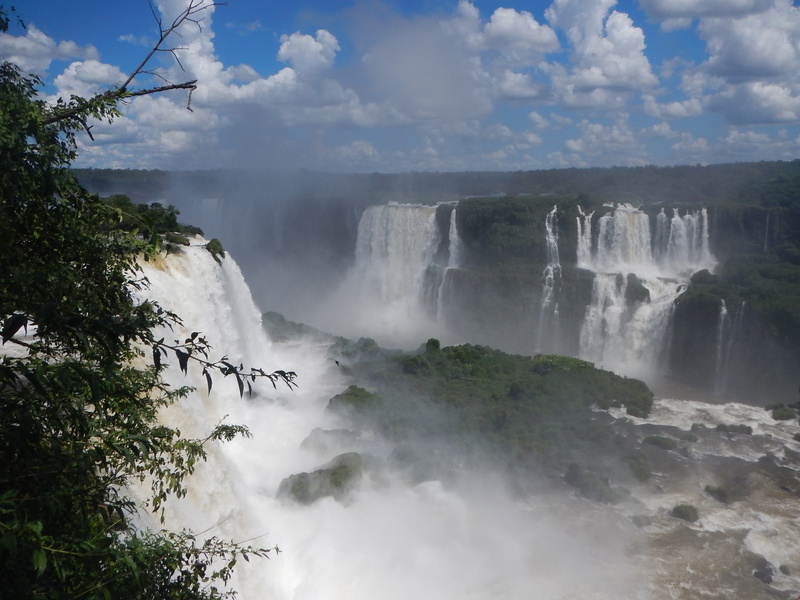 From Curitiba, I took a few days to visit one of Brazil’s (and Argentina’s) most popular tourist attractions: Iguazu Falls (Cataratas do Iguaçu if you’re speaking Portuguese or Cataratas del Iguazú if you’re speaking Spanish). Iguazu Falls is situated on the Rio Iguaçu, along the border of Brazil and Argentina, a river which has its source in the mountains of Paraná and Santa Catarina. The falls complex consists of over 275 waterfalls and makes for a massive panorama of gushing water. The region was sacred to the indigenous Tupi-Guarani and Paraguas people and “discovered” by the Spanish in 1541. 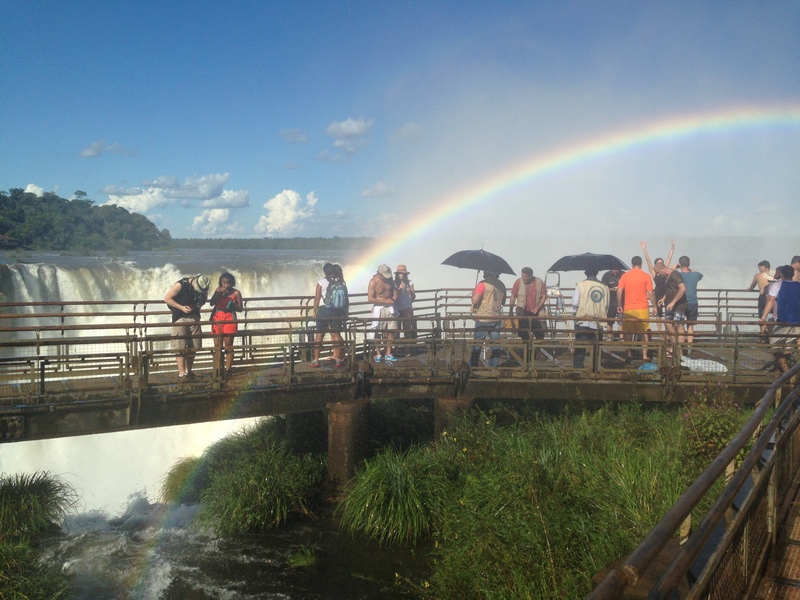 In modern times, the falls were used in the filming of the James Bond movie Moonraker, as the climax of a boat chase down a Brazilian river. 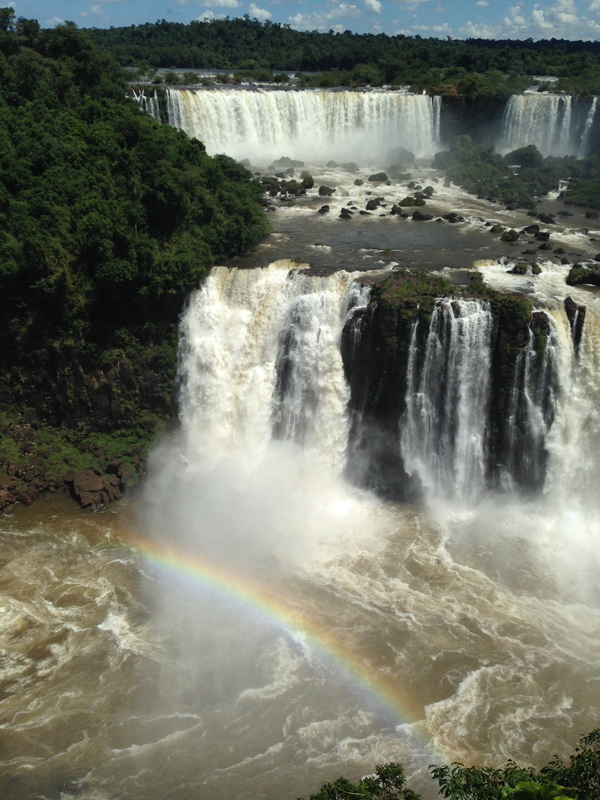 Iguazu Falls is now a UNESCO World Heritage Site and considered one of the New Seven Wonders of the World. To get to Iguazu, I took an overnight bus with Catarinense, which wasn’t as miserable as it might sound. I recommend bringing a blanket with you if you take the night bus though, as they crank up the air conditioning on the journey. The bus pulled into the Foz do Iguaçu bus station around 6:00 am. 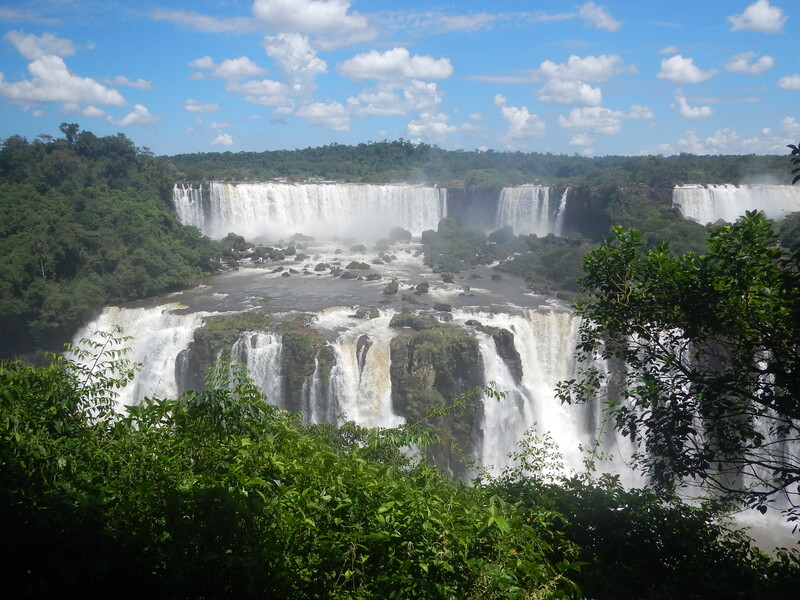 Because it was still really early and because I didn’t have a feel for how safe Foz was, I decided to take a taxi to my guesthouse, the Iguassu Guest House. Even though I arrived before the official check-in time, I was able to get into my room and get a few more hours of sleep before going to explore the falls. 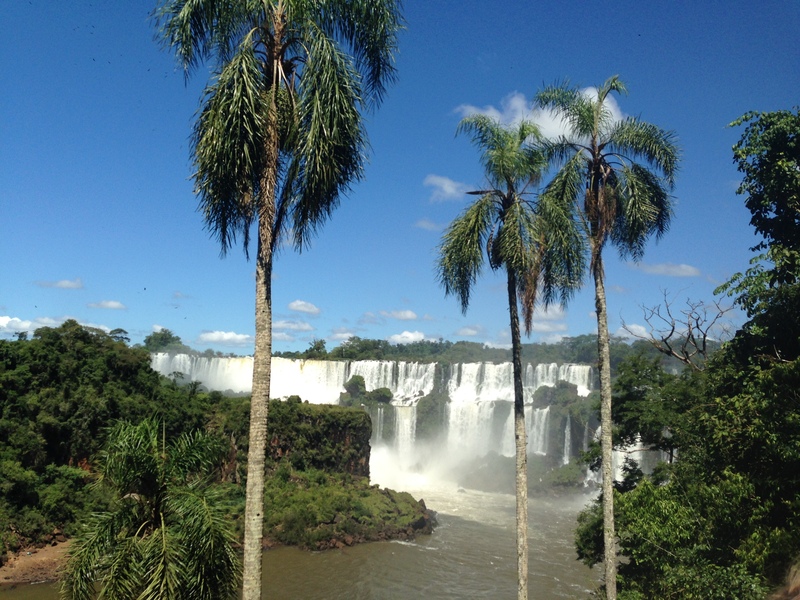 If you’re staying on the Brazil side of the falls, it is really easy to get to the Parque Nacional do Iguaçu. The Iguassu Guest House is a short walk to the central bus terminal (TTU). From there, I took a city bus down to the National Park. The ride was about 20-30 minutes long as the bus makes a number of stops in the city of Foz. Once I arrived at the National Park, I picked up the entrance ticket that I had purchased online and boarded another bus (belonging to the park) which made it’s way through a dense forest with colorful butterflies flitting their way along the strands of wind. After the bus stopped in front of the stately Hotel das Cataratas, I got out and walked to the promenade along the edge of the falls. Every vista was a photo opportunity and I took several pictures along the way. The numerous cascades are breathtaking and the blue-sky day was perfect for taking pictures of nature’s spectacular show. I would definitely advise visiting the Brazilian side in the morning for photography because the sun will be in the east, shining down on the waterfalls. 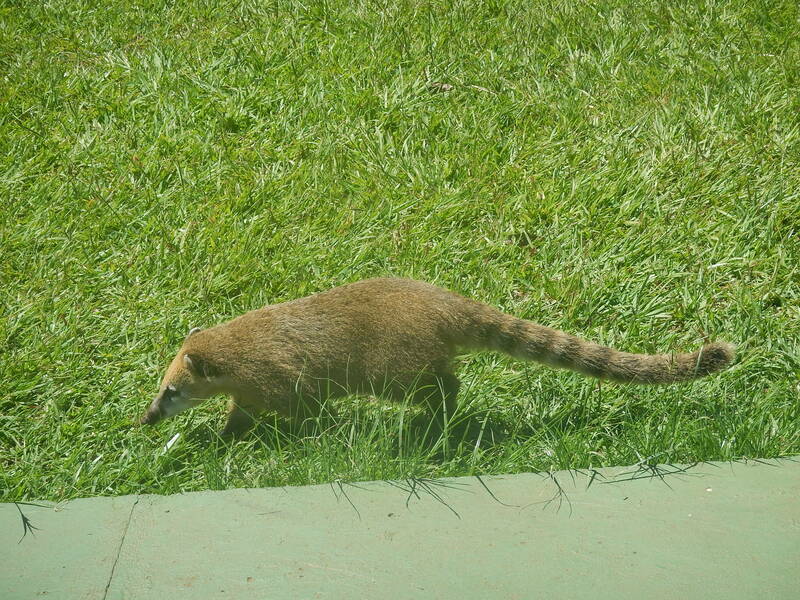 Scurrying around the waterfalls are furry creatures called coatis. These carnivorous mammals are members of the raccoon family. They have long snouts that make them look like anteaters and they can be seen wandering around the national park. Signs around the park warn visitors not to feed them. If they are anything like their raccoon cousins, I can imagine they could get be nasty and ferocious. The panoramic trail ends at a platform that goes out beneath the gushing Garganta do Diablo (Devil’s Throat) cascades. Out on the platform, you are guaranteed to get wet, but it’s a great opportunity to get up close and personal with the power of Iguazu. I am told that in the winter time, the water level is so high that the platform is completely submerged. After getting soaked on the platform, I climbed up the panoramic tower, which gives you an incredible view of the falls below. Visiting the Brazilian side of the falls didn’t take very long. You can probably accomplish the visit in about two hours if you are in a hurry. I decided to wait to do any boat rides on the Argentina side because they are quite a bit cheaper there than in Brazil. I returned to my hostel and lounged for the rest of the afternoon. I went to dinner at a restaurant about a half mile away called Chef Lopes, which is recommended in Lonely Planet and also by my hostel (mostly for lunch). It was a decent place, with English speaking waitstaff, but in a somewhat sterile space. The city of Foz is pretty deserted at night. Avenida Brasil, the main shopping corridor, seems to have the most activity, but it was still fairly quiet. 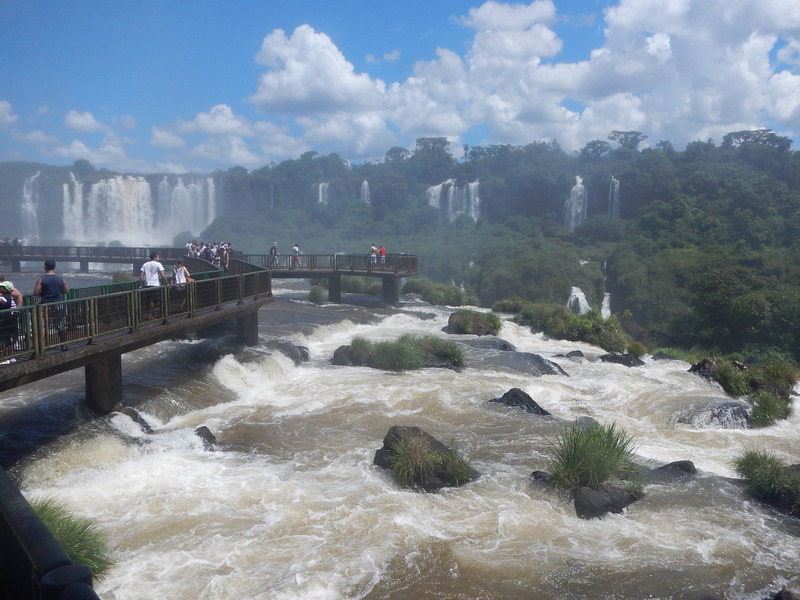 On my second day in Iguazu, I visited the Argentina side of the falls. I was going to try and venture over there myself, but because the trip involved border crossings there and back in the same day and figuring out the local busses, I decided to save myself the trouble and go there with a tour, which cost R$140 including park admission. While a bit expensive, I thought this was worth it. The park on the Argentina side is huge and I would have been worried about catching the last bus over the border had I decided to do it on my own. The tour was also a fun way to meet other travelers in the area. On the tour, I befriended a really fun and nice Australian couple who were traveling on a wild and crazy world adventure like mine. For US Citizens, visiting Argentina requires payment of a reciprocity (spite) fee of $160 (which is good for 10 years once paid). Australians and Canadians also must pay fees as well, but in different amounts. Nowadays, you pay the fee online and bring a printout of the receipt to the border crossing with you. I visited Buenos Aires in 2011, so I already had a copy of the receipt in my passport, which worked out just fine. 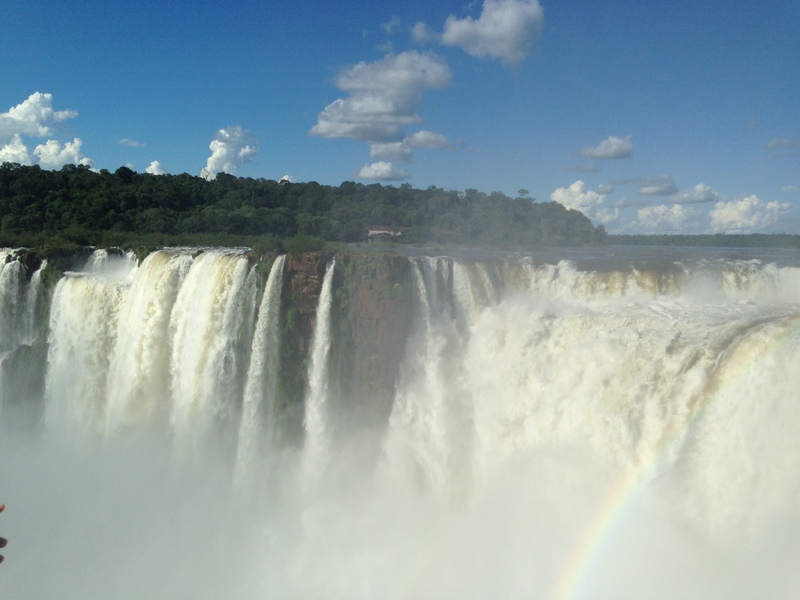 The Argentina side of the falls is really impressive. 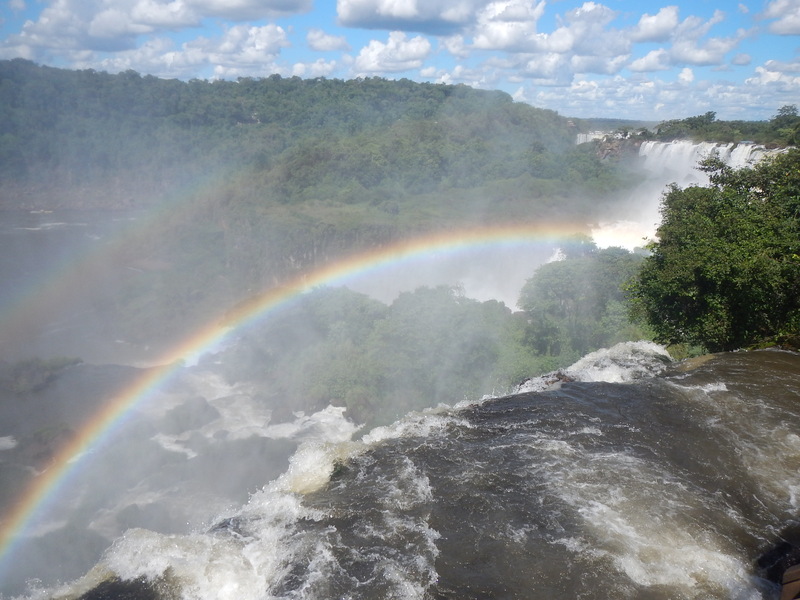 Their national park is larger than the Brazilian side and has trails winding around some of the cascades, giving you some beautiful views and the waterfalls and rainbows. The tour guide first took us down some longer trails which winded their way along the edge of the canyon. 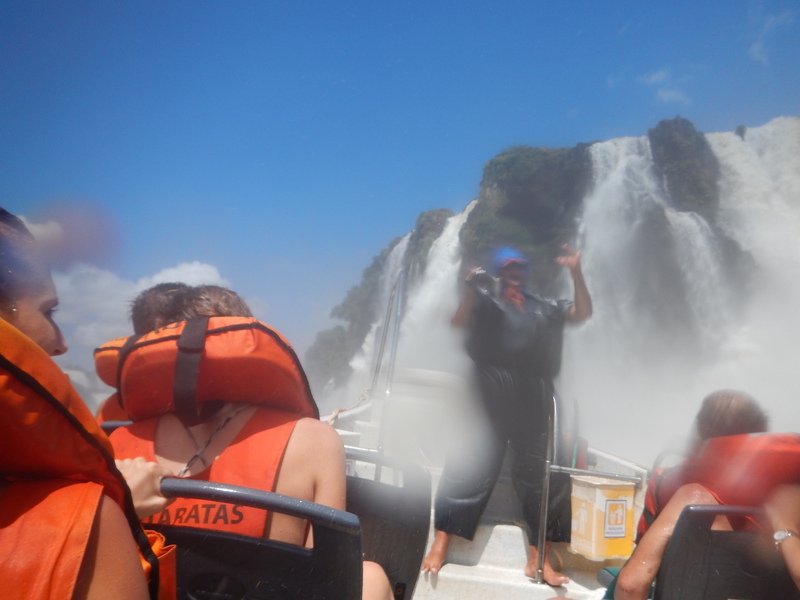 Midway through the day, we took a boat ride for R$80 which came very close to the bottom of two of the waterfalls. I definitely got soaked and it was hard to take pictures or video with all of the water pouring down on you. The trip was a lot of fun though. After lunch, we hiked a few more trails. We saw some monkeys scampering through the trees and a caiman lurking in the muddy waters near the top of the falls. 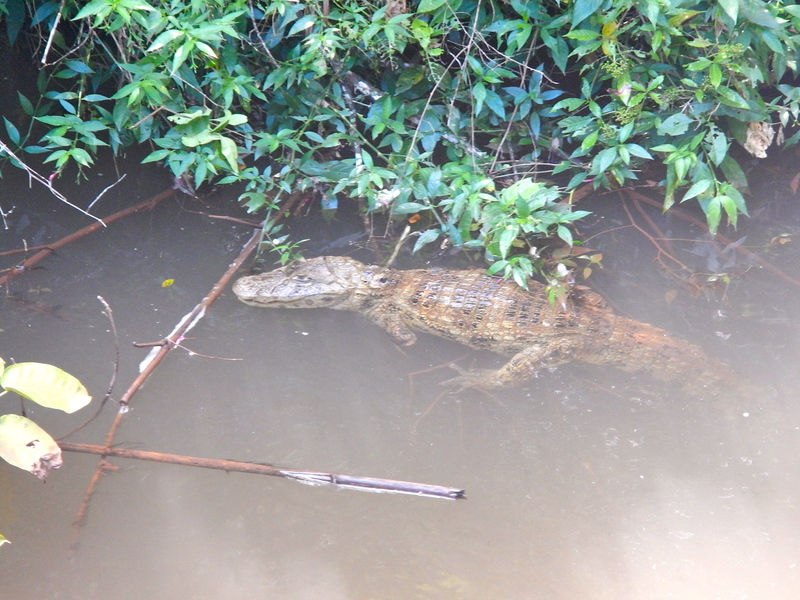 I wondered how the caiman knows not to swim too close to the edge of the waterfall. Our last hike of the day involved a train ride out towards the Garganta del Diablo. From where the train stops, it’s another kilometer hike across bridges out to the viewing platform. There, you are met with an expansive view with misty rainbows everywhere. After one last gaze at the falls, we headed back over the border to Brazil. 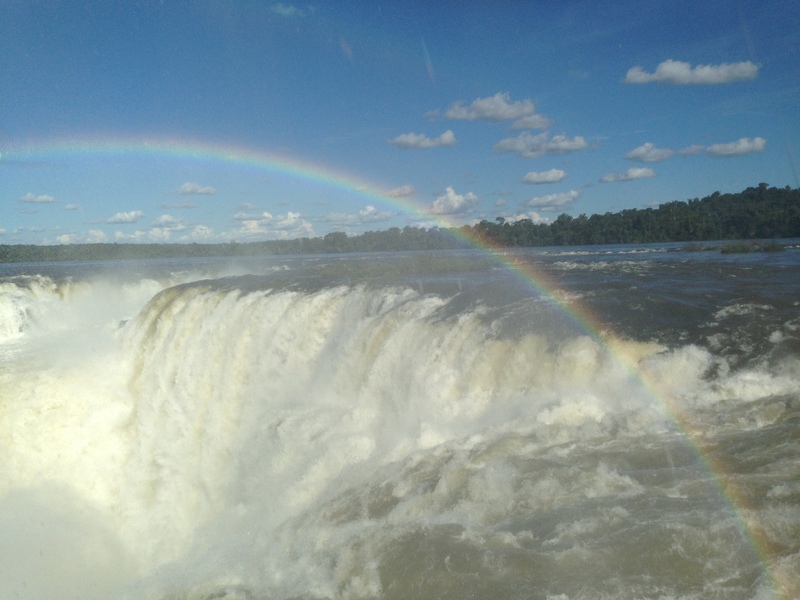 I spent one more day in Iguazu, where I visited the Itaipu Dam (which will be covered in a subsequent post). You can definitely accomplish a trip to Iguazu, visiting both sides of the falls, in two full, well-organized days, but add another day if you want to see Itaipu, go shopping in Ciudad del Este, Paraguay (although I was told that it’s rather shady over there), or visit one of the other attractions in the area. 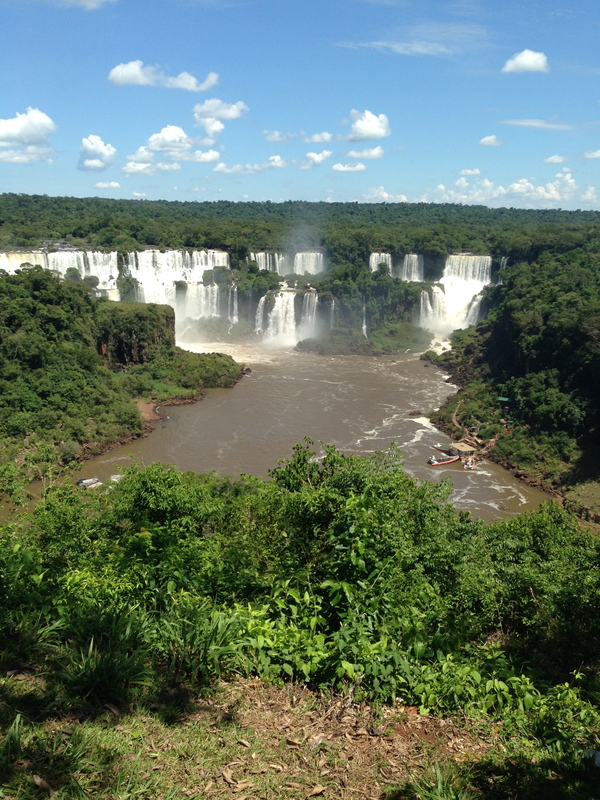 Undoubtedly, you should put Iguazu high on your list of places to visit in Brazil. It’s truly an unforgettable experience.